Dr. Michael L. Norman, named SDSC interim director in June 2009 and appointed to the position of director in September 2010, is a distinguished professor of physics at UC San Diego and a globally recognized astrophysicist. Dr. Norman is a pioneer in using advanced computational methods to explore the universe and its beginnings. 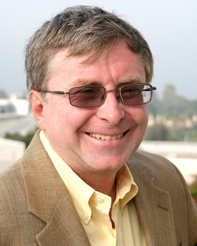 In this capacity, he has directed the Laboratory for Computational Astrophysics -- a collaborative effort between UC San Diego and SDSC resulting in the Enzo community code for astrophysics and cosmology in use worldwide. Following his appointment as SDSC's chief scientific officer in June 2008, Dr. Norman worked to foster collaborations across the UC San Diego campus for cyberinfrastructure-oriented research, development and education. He also serves as division director of SDSC's Cyberinfrastructure Research, Education and Development (CI-RED), and is the Principal Investigator for two of SDSC’s leading HPC systems – Gordon and Comet – which together represent more than $42 million in National Science Foundation funding. Dr. Norman's work has earned him numerous honors, including Germany's prestigious Alexander von Humboldt Research Prize, the IEEE Sidney Fernbach Award, and several HPCC Challenge Awards. He also is a Fellow of the American Academy of Arts and Sciences, and the American Physical Society. He holds an M.S. and Ph.D. in engineering and applied sciences from UC Davis, and in 1984 completed his post-doctoral work at the Max Planck Institute for Astrophysics in Garching, Germany. From 1986 to 2000, Dr. Norman held numerous positions at the University of Illinois in Urbana, as an NCSA associate director and senior research scientist under Larry Smarr, currently UC San Diego's director of the California Institute for Telecommunications and Information Technology (Calit2); and as a professor of astronomy. From 1984 to 1986, he was a staff member at Los Alamos National Laboratory.